For nearly 400 Canadians it was a winter like no other. Instead of the snow and sub-zero temperatures of their native land, they faced the soaring heat and sun-scorched desert of the Sudan in far-off sub-Saharan Africa. It was the winter of 1884-85, and the Canadians were there because they were skilled in handling small boats on rough river waters. 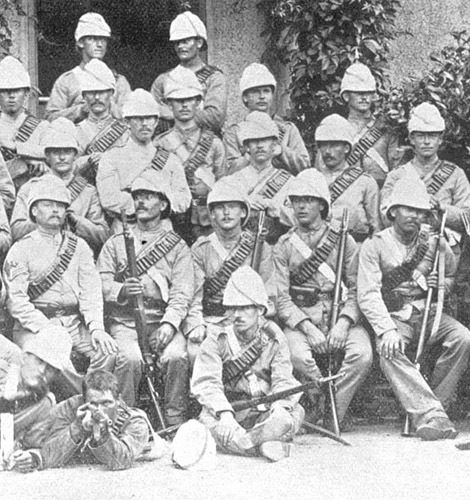 The boatmen and lumbermen–many of them Indians–were attached to British General Sir Garnet Wolseley’s Nile expedition. Their job was to help rescue Major-General Charles Gordon who was besieged at the Sudanese capital of Khartoum, located on the Nile approximately 2,000 kilometres south of Cairo, Egypt. The expedition marked the first time that a Canadian contingent served overseas. The Canadians, known at the time as the Nile Voyageurs, were hired to operate the boats that would carry the relieving force of British soldiers up the longest river in the world. Tough and reliable, these men were hired as a result of Wolseley’s experiences in Canada during the Red River Rebellion of 1870. That was when Wolseley led an expedition against Métis leader Louis Riel’s insurrection at Fort Garry, Manitoba.